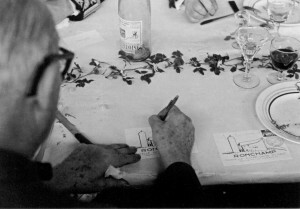 Le Corbusier. Ronchamp, 25 juin 1955. La fin du repas lors de l’inauguration de la Chappelle Notre-Dame-du-Haut. Le Corbusier. Ronchamp, June 25th, 1955. The end of the meal on the day of the inauguration of the Chapel of Notre-Dame-du-Haut.